Bookshelf Roundup is a feature I do every two weeks where I talk about the new books I’ve added to my library or received for review, what I plan to read soon, and what I’ve finished reading since the last update. Sometimes I throw in stuff like reading challenge updates, book lists, and other random bookish things. Our Lady of the Ice by Cassandra Rose Clarke – Print ARC, with thanks to Saga Press. One of the more squeetastic arrivals this week. I’ve been wanting to get my hands on this book since CRC and I chatted about it in last year’s BiblioSanctum interview. Burning Midnight by Will McIntosh – Print ARC, with thanks to the author. This is another one of my highly anticipated reads! After seeing me feature this book and seeing how how excited I was for it, Will McIntosh actually messaged me a couple weeks ago offering an ARC. Thank you, Mr. McIntosh, you definitely made my day! The Martian by Andy Weir – Paperback (movie tie-in edition!) with thanks to Crown Publishing. When Crown’s publicist emailed me about this book last month, I wrote back with my thanks but also let her know that I’d already reviewed it last year. Imagine my surprise and delight then, when she arranged a copy to be sent anyway for my personal stash. Crown, you guys are awesome! This worked out perfectly too, since I only owned the ebook and audiobook. I am so happy and grateful to FINALLY have a physical copy of this most excellent novel (and with Matt Damon’s face on it, bonus!) If you haven’t already, you must read this. I can’t wait for the movie. The Pilots of Borealis by David Nabhan – Paperback, with thanks to Talos. Skyhorse Publishing spoils me once again with another surprise arrival. I had to look this one up because it was unfamiliar to me, but it sounds really cool. Already, I’ve been seeing folks say how intrigued they are by the description, and I absolutely agree. Alice by Christina Henry – Paperback, with thanks to Ace/Penguin. Another exciting new arrival. It also occurred to me that of the many retellings I’ve read in my life, none of them have ever been about Alice in Wonderland. What the, how is this possible? So this will be my first, and I can’t wait. I’ve been hearing so much great stuff. The Geomancer by Clay Griffith and Susan Griffith – Print ARC, with thanks to Pyr Books. 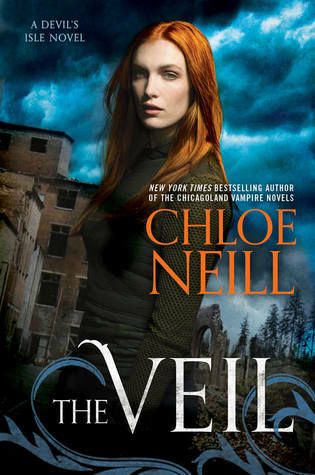 Hooray, the Griffiths return with another Vampire Empire novel! This was a surprise arrival but I flailed hard when I saw it come out of the package — I love Adele and the Greyfriar. I realized I still have the third book to read before I get caught up though, but believe me when I say IT WILL BE DONE. Regeneration by Stephanie Saulter – Paperback, with thanks to Jo Fletcher Books. I knew when I saw a care package for me from London that it would be from the wonderful folks at JFB. What I didn’t expect was to see that it contained book three of the ®Evolution series. I LOVED the first book and I still have to catch up with the second, so both are being bumped up on my TBR. Devil’s Pocket by John Dixon – Paperback, with thanks to Simon & Schuster (Gallery Books). A surprise arrival which hadn’t previously been on my radar, so of course the first thing I did was to go find out as much as I could about it. After some research, I discovered it’s actually the sequel to last year’s Phoenix Island! I’ve definitely heard of that one. 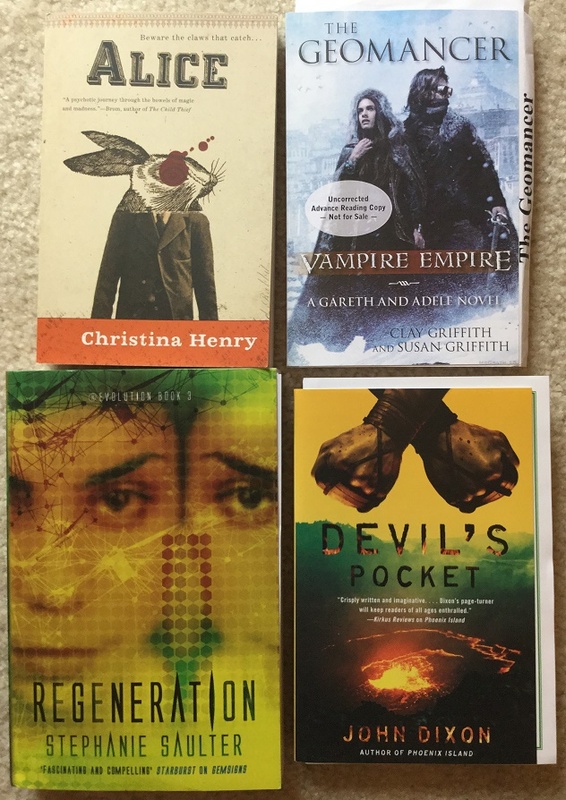 A lovely chat with the publicist let me know that I can jump into Devil’s Pocket even if I haven’t read the first book, which is great news. I’ll definitely have to find time for this. 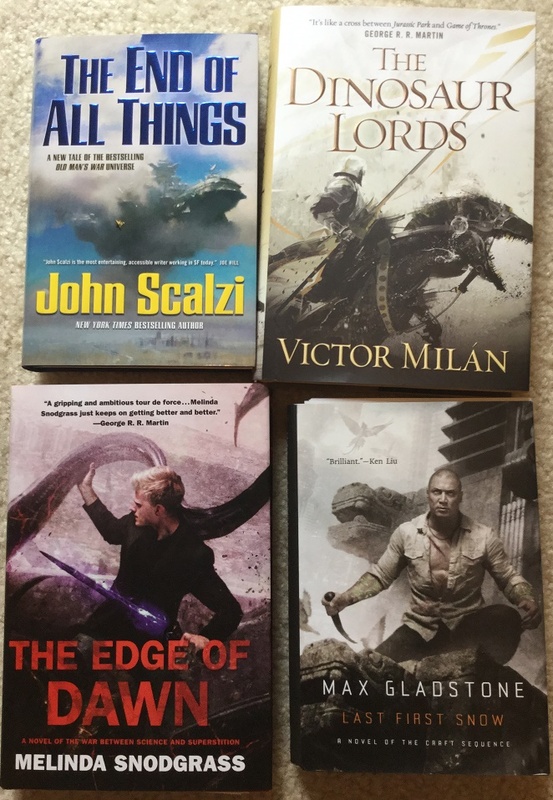 The End of All Things by John Scalzi – Hardcover, with thanks to Tor. I absolutely adore the Old Man’s War series so you can imagine my joy when this came out of one of the packages. A serialized novel, The End of All Things is a follow up to events from The Human Division (which was also a serialized novel). This one will soon be devoured, you can count on it. The Dinosaur Lords by Victor Milán – Hardcover, with thanks to Tor. 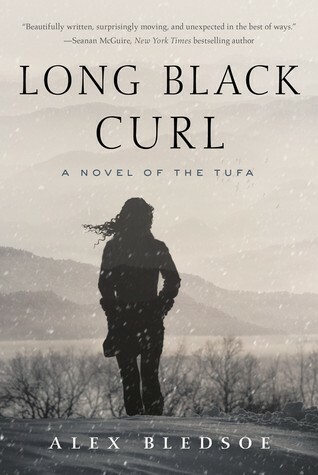 I was previously sent an eARC of this roartastic novel (be sure to check out my review, link is below) so I hadn’t anticipated this finished copy, but it’s much appreciated! The presentation is simply incredible, too: deckle edges plus amazing illustrations. 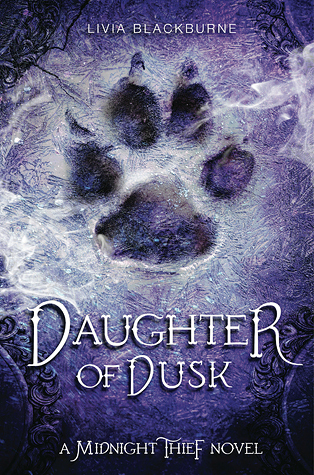 The Edge of Dawn by Melinda Snodgrass – Hardcover, with thanks to Tor. This one was completely new to me, so once again I used my googlefu to learn more. 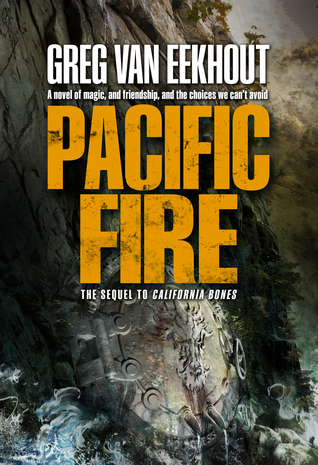 As I’d guessed, this is a later installment (book 3, specifically) in a cool looking series called The Edge. I have no idea if it’s possible to jump on board mid-series starting with this book though, so I’ll have to wait and check out some reviews. Last First Snow by Max Gladstone – Hardcover, with thanks to Tor. I’m actually reading Full Fathom Five with my co-bloggers in a blogger readalong right now, so the arrival of this was quite timely indeed. I’m thinking about jumping right into this as soon as I’m done — unless a later readalong is scheduled for LFS as well. I hope so, because I’m having a lot of fun with the FFF readalong right now. 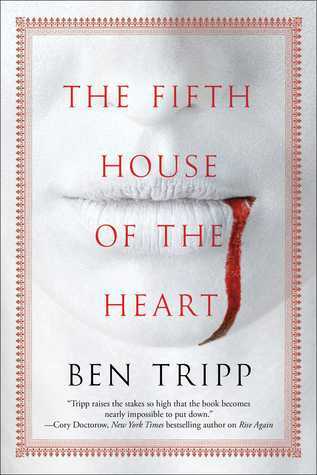 The Fifth House of the Heart by Ben Tripp – eARC, with thanks to Gallery Books and NetGalley. Even accounting for unsolicited titles, the length of my to-be-reviewed list is giving the Great Wall a run for its money, so I thought long and hard before I requested this. Oh, who am I kidding, this book looks amazing! It’s gotten glowing reviews from a couple bloggers I follow already, so no regrets. Blood Call by Lilith Saintcrow – eARC, with thanks to Orbit. 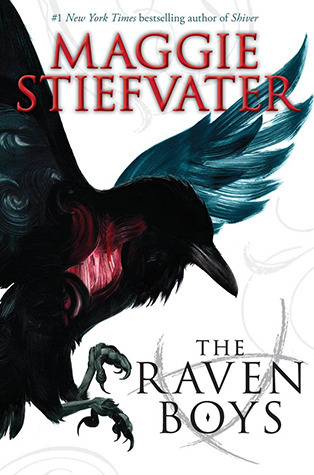 My experience with Saintcrow’s Trailer Park Fae didn’t go so well, but then I’m a mood reader and it’s true that the book was very different from what I expected. I still wanted to give her other books a chance though, and so when Orbit sent an invite to this one, I couldn’t resist. This time, I know what I’ll be getting: Blood Call sounds exactly like the paranormal thriller it’s meant to be and that’s perfect for me. 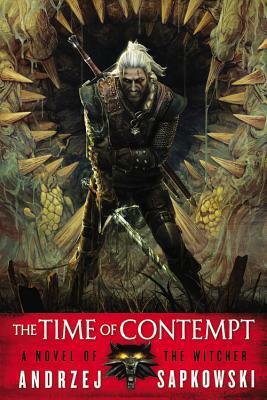 The Time of Contempt by Andrzej Sapkowski – Audiobook CDs, with thanks to Hachette Audio. To say I’m thrilled that these Witcher books are finally available in English audio is an understatement; I still have to pinch myself sometimes to make sure I’m not dreaming. The books are still gradually being released as audiobooks, and I am grateful to Hachette Audio for the opportunity to review them. 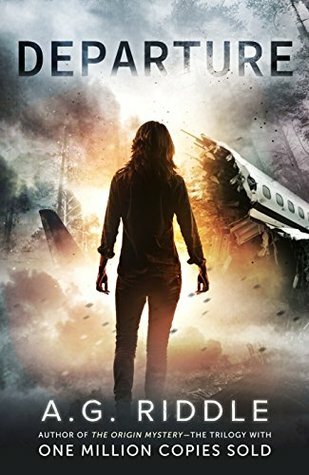 Departure by A.G. Riddle – Audiobook, with thanks to Audible Studios. I was actually first introduced to this one as an audio title, so I had no idea that the book was originally self-published. Guess news of its success is catching on, because I also only just learned HarperCollins is re-issuing it later this year. 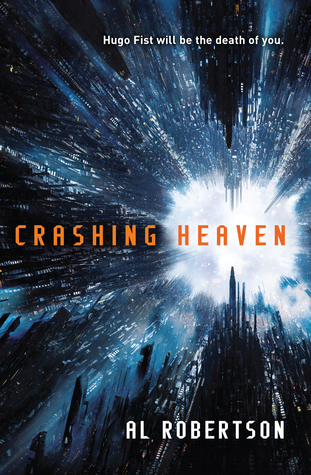 It’s about a plane crash, so I’m prepared to be scared out of my wits by this sci-fi thriller. With so many new additions to my library, thankfully I’m also reading a lot. My Goodreads shows that I read a total of 21 books in July! It’s probably a new record for this year. I credit the weekend mini-vacation I took with my family last week, the convenience of audiobooks during long car rides, and the fact that a lot of my reads this month were relatively short. My burst in productivity is also reflected in the number of reviews I put up recently. Keep an eye out for reviews of my completed books in the coming weeks, but of course there are a bunch that are up already. Be sure to check ’em out now if you haven’t yet! Hahahah The Martian *with* Matt Damon’s face on it? That is a total win! I so can’t wait to see The Martian in theaters! All the previews I seen for it look good and just as funny as the novel. I have high hopes for it! The trailer was awesome! The tone of the movie actually looks less humorous than the book though, but I understand they need to play up the thrills! Aaaahhh so jealous of this haul. I need some of these! Especially Our Lady of the Ice, Last First Snow and The Dinosaur Lords. The Dinosaur Lords was really good! And I’m looking forward to OLotI so much. And I thought I was safe coming to your site. PFFT! 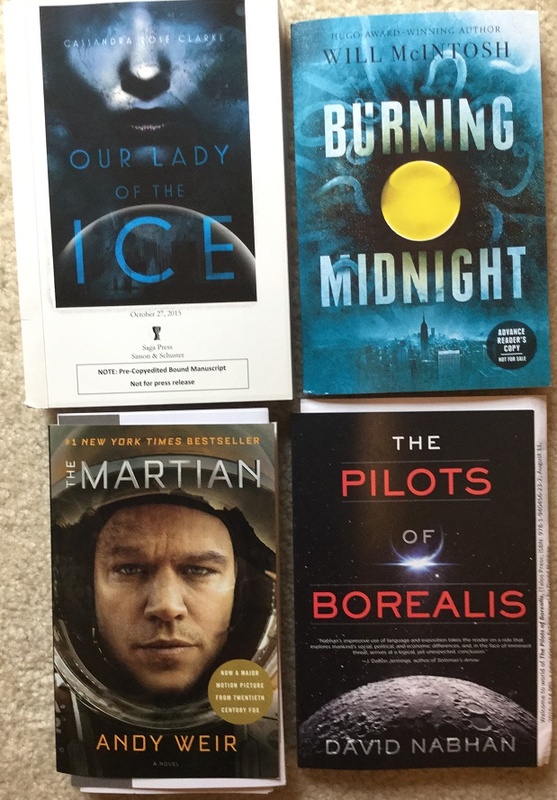 Now I have at least 5 new books to watch for because they look too good to pass up! Thanks!! Hee hee, sorry (not sorry) 😉 You’re very welcome! I’m so glad, helping readers find new books makes me happy! Wow, what an epic haul! 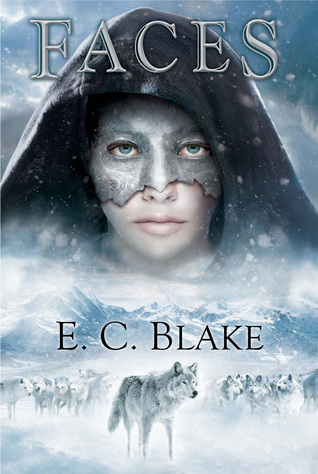 I believe I have a copy of Our Lady of the Ice coming my way, soo excited for that book. I’ve read some great reviews of Devil’s Pocket, and I got a copy of Departure at SDCC. I hadn’t really heard about it before, but since you’re featuring it, I may read it after all. It’s funny, because I think if Departure hadn’t been showing up on all these top lists at Audible I probably wouldn’t have heard of it either. This is the kind of post that makes me wish – once again – for a time-dilation device, so I can increase my reading time…. I look forward to seeing what you think of Departure 🙂 I’ve not heard of Devil’s pocket either, but am intrigued. I know, I loved Gemsigns. I need to catch up with book two, I don’t know what I’m waiting for. Haha – I still haven’t read Gemsigns – even though I managed to buy TWO copies! Doh. Loads of awesome sauce on here though! Looking forward to your reviews. Actually, I think I may have two copies of the second book, Binary! But one is the UK version and one is the US at least, lol!